Sue, I feel your pain! My husband used to be a little bit the same way – he didn’t think our possessions were hurting anything so he wanted to keep everything, “Just in case.” He’s come a really long way, but it’s taken some time! Even if you don’t have a lot extra and he has a ton, get rid of some of your own things before asking him to get rid of his extra stuff! After-all, you probably wouldn’t want him to hang onto all of his own things while simultaneously suggesting that you take your treasured items to Good Will! Don’t belittle him for feeling the way he feels. Most of the time when someone has a hard time letting items go, there’s a deeper emotional issue. Sometimes it was simply the example their parents set. Other times there may have been a traumatic event such as a divorce, house fire, or death that caused a sudden unexpected loss of possessions. Take time to get to the heart of the issue. 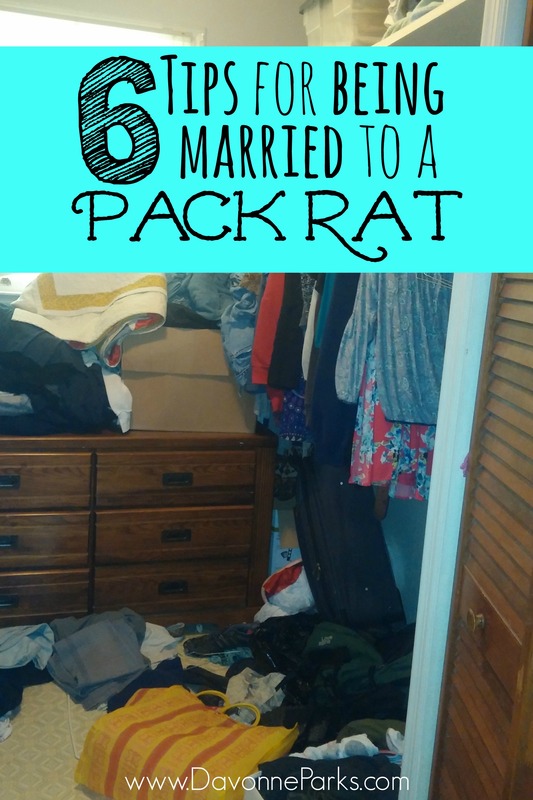 Trying to declutter my home was a little frustrating at times because I knew we didn’t need something, but my husband wasn’t ready to part with it. Our solution was one closet where I could put things I came across that I thought we could get rid of but I knew he’d want to keep. It took a few years (and a very full closet) before he was ready to clean it out, but at least the items were out of my way during that long wait! Just as we want others to love and accept us how we are, we need to love our husbands how they are, pack-rat tendencies and all! He won’t grow out of this overnight, so be patient and kind as he slowly works on himself. There are women who will make things “disappear” when their husbands aren’t looking – I don’t recommend this! It’s like slapping a band-aid on the actual problem and it also weakens trust in the relationship. Instead, follow the other five steps and pray that God will soften your husband’s heart about your desire to have a welcoming home. Personal Thought/Application Question: What tips do you have for someone who is dealing with clutter their spouse doesn’t want to part with? Chris, I completely agree that if a few extra “things” are the worst thing, then we have it really good! Thank you for commenting with that great thought.